Rs. 500, Rs. 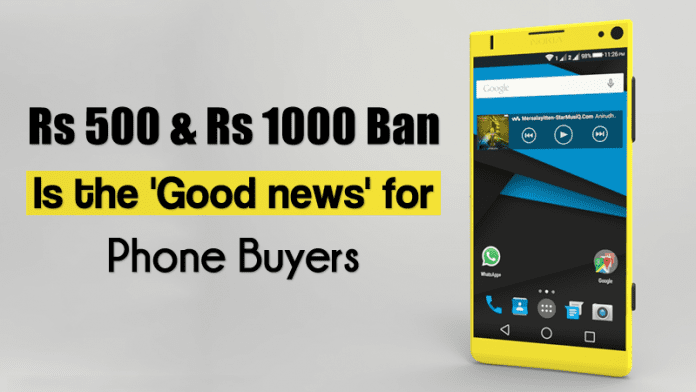 1,000 Ban is a good news for potential smartphone buyers in India. Some mobile retailers are offering handset at zero down payment. We all know that in an unprecedented move, Indian Prime minister Narendra Modi declared that currency notes of Rs. 500 and Rs. 1,000 won’t be accepted as legal tender from November 9th. There is a huge rush of peoples outside various banks to exchange the old notes for the new ones for daily expenses. When we decide to buy any smartphone, we always tend to make payment from either Rs 500 or Rs.1000 notes because those notes are easy to count. However, after the demonetization smartphone stores and online channels are seeing the major slowdown in sales. Now mobile phone retailers have started offering zero down payment options to stir sales that have slowed down drastically over the past week. One such retailer is Sangeetha Mobiles, which has 300 stores in several states of South India. So, retailers are utilizing the method of financing which you can say “EMI”. In EMI part of the cost of the phone is paid up front while the rest is paid in monthly installments at a certain rate of interest. So, retailers are now allowing users to buy phones without any down payments. After the launch of this scheme, Subhash Chandra said: “we have got some breather from the horrible sales”. Not only this, other retailers, especially consumer of electronics and phones, have started rolling out various schemes that could encourage users to buy an electronic device.